Are you fed up of being at home on holiday because of your German Shepherd? Pass a weekend with your pet outdoors. With our Extra Light Dog Harness it is possible. You can keep your doggy harnessed even for all day long. Thanks to convenient shape and light weight of this supply your pet won't be tired from walking, training and just playing in the open air. 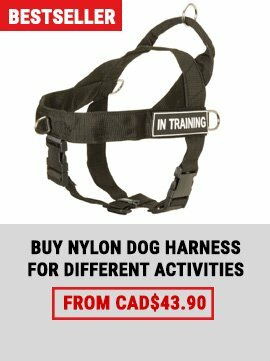 This harness has similar functions as a collar, but in comparison with a collar it doesn't press on a dog's neck and distributes the pulling force along torso of your German Shepherd. Such advantage is helpful for very active dogs. The shape of this All Day Wearing Dog Harness is designed for free movement and breathing without any discomfort. This supply covers the less part of a dog's torso area that makes it light weight and almost imperceptible for your pet. And don't doubt, this light harness is quite reliable, because it is made of strong genuine leather. 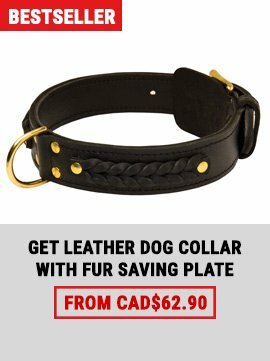 By the way, the straps are wide enough not to cut into a dog's body and the leather is soft enough to prevent skin rubbing and irritation. So the straps which this supply is constructed from combine two opposite but important qualities: strength and flexibility. 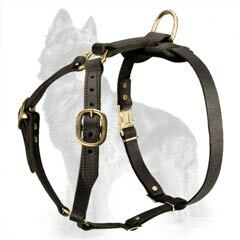 For more durability of this harness our craftsmen stitched all leather parts well and equipped it with luxurious brass fittings. 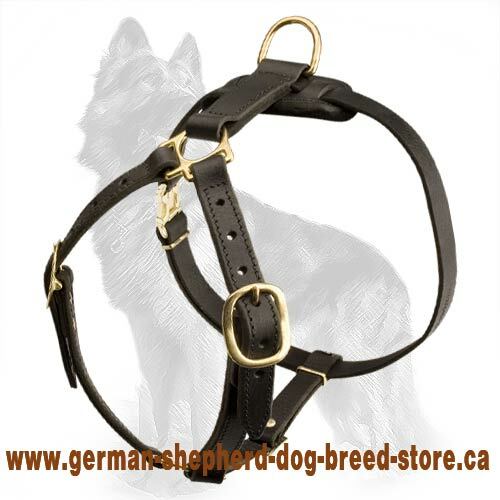 One back strap has an easy quick release buckle to put this product on your German Shepherd in shot period of time. And also the back plate is equipped with strong D-ring for leash attachment. Besides, all the hardware has brass covering that prevents rust and metal corrosion. One more advantage of this Leather Dog Harness is its multifunctionality. 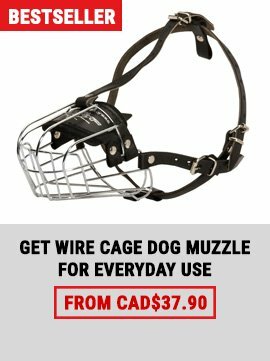 It can be used as for walking or playing outside so for active training sessions (obedience training, tracking, pulling and so on). Dear Customer, pay you attention to scheme of a dog's measurement for choosing the right size of this supply. The comfort of your pet depends on your decision. And, please, take into consideration that for long service of this harness you'd better to care of it with special creams and sprays intended for leather products.